$12 per day for parking. SEPERATE BEDROOM FROM THE LOUNGE ROOM. The Rydges 1 Bedroom Queen Hotel Suite is a newly refurbished, modern, comfortable and non smoking suite, fully furnished for guest ultimate comfort with contemporary design and decor, while boasting spectacular views of the Canberra City or Lake Burley Griffin and surrounding mountains. Ideal for a single, couple or corporate traveller looking for extra space and privacy, the suite further offers air conditioning and heating, a seperate bedroom with 1 comfortable Rydges Queen dream bed, a private ensuite bathroom with shower, bath, toilet, hairdryer and complimentary bathroom amenities, a seperate lounge room with 42" LCD TV, movies on demand, minibar, tea/coffee making facilities, high speed broadband internet access ( fee applies), desk, radio, alarm clock, wake up service, iron/ ironing board and a private balcony / courtyard. GREAT VIEWS FROM YOUR PRIVATE BALCONY. 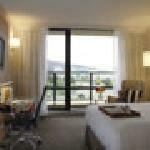 The Rydges Queen Hotel Room is a newly refurbished, modern, comfortable and non smoking room, fully furnished for guest ultimate comfort with contemporary design and decor, while boasting spectacular views of the Canberra City or Lake Burley Griffin and surrounding mountains. Ideal for a single, couple or corporate traveller, the room further offers air conditioning and heating, 1 comfortable Rydges Queen dream bed, private ensuite bathroom with shower, bath, toilet, hairdryer and complimentary bathroom amenities, 42" LCD TV, movies on demand, minibar, tea/coffee making facilities, high speed broadband internet access ( fee applies), desk, radio, alarm clock, wake up service, iron/ ironing board and a private balcony / courtyard. Disabled friendly rooms are available. If required please specify in the Special Requests Section of your Booking. HIGH FLOOR FOR SPECTACULAR VIEWS. The Rydges Superior Queen Hotel Room is a newly refurbished, modern, comfortable and non smoking room, fully furnished for guest ultimate comfort with contemporary design and decor. Situated on a high floor to ensure stunning views of the Canberra City or Lake Burley Griffin and surrounding mountains, the room is ideal for a single, couple or corporate traveller, further offering air conditioning and heating, 1 comfortable Rydges Queen dream bed, private ensuite bathroom with shower, bath, toilet, hairdryer and complimentary bathroom amenities, 42" LCD TV, movies on demand, minibar, tea/coffee making facilities, high speed broadband internet access ( fee applies), desk, radio, alarm clock, wake up service, iron/ ironing board and a private balcony / courtyard.